Every week Meet The Band gives you the chance to get to know a new or up-and-coming artist. This week, the Massachusetts group Worshipper, whose debut album is Shadow Hymns, are in the spotlight. Vocalist/guitarist John Brookhouse and guitarist Alejandro Necochea introduce us to their band. Chad Bowar: Give us a brief history of Worshipper. 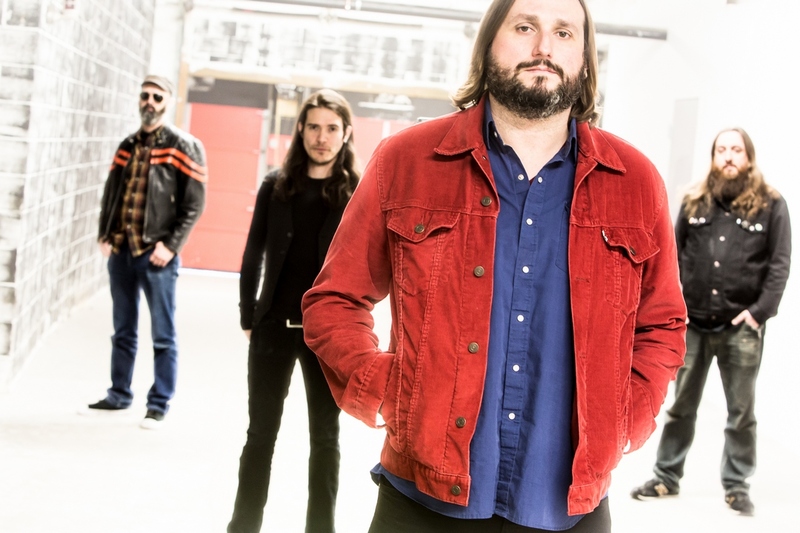 John Brookhouse: I was in that mopey post-band implosion mode after my last attempt at doing a heavy band failed and Al started sending me Facebook messages suggesting we get something going. So, we passed riffs back and forth online for a few months and right about when we felt that we had enough stuff to work with to bring other people in. Bob’s band broke up and he contacted both of us separately about getting a project going. Then I sort of drunkenly told Jarvis he was the drummer one night and he didn’t say no, so here we are. I ended up singing because I just didn’t want to deal with “trying to find a singer” ever again. I never really thought I could do it, but I’m enjoying it now. Alejandro Necochea: Sometime in 2013 John and I started slowly ruminating on putting together a band. When we were imagining it I don’t think anyone other than Bob and Jarvis were considered for bass and drums. Both are known heavy band guys in our circles and I have known them both for some time and have always thought we’d see eye- to-eye creatively. The timing was serendipitous and we got all the right guys in the band. Like John says, none of us really wanted to deal with finding a singer, so I was pretty happy when he volunteered to give it a shot. Describe the songwriting and recording process of Shadow Hymns. John: One of the original rules we tried to impose was “No writing in the space.” So, as much as I love jamming and spontaneous ideas, I just wanted to try more of a thought-out approach to writing songs. So most of the time we bring in an idea and work on it for a bit, but the second it gets to that “what should we do next?” situation, I try to stop, bring it home and flesh it out or tweak it to make a more cohesive song. Alejandro: Songwriting comes slowly for us. It can be a painful process, to be honest, and there doesn’t seem to be any one formula we use to get it done. In the beginning, we got our start developing loose riffs Bob brought in. We’d jam and work collaboratively arranging the music and then John would take it home and work up a vocal. Other times John brings in a song that is more or less fully fleshed out and the band will work together to arrange it in a way that satisfies everyone. That’s the part that is often slow and painful. Everyone of us is highly opinionated, so much of what we create goes through a rigorous process of creation and editing by committee. In the end, that’s how and why a Worshipper song sounds the way it does which, to us, is probably best described as the cliched “greater than the sum of its parts.” Which is great and extremely satisfying. It makes the whole enterprise completely worth it. The recording side of things, in comparison, is much easier. By the time we get to the studio the songs are pretty much completely worked out and the challenge is getting the right performance on tape. We worked with Benny Grotto at Q Division and Mad Oak Studios and were glad to have him take the reigns and get great sounds and create an easy vibe to get things done. John: I think “darkly epic” is an apt description. Genres are kind of weird for us, as we fit into a lot of them, a lot of times in the span of one song. We get metal, ’70s hard rock and NWOBHM thrown at us a lot and that’s totally fine, because we love that stuff. But, I really like early Pink Floyd and a lot of pysch pop/garage stuff, so that influence ends up in there for some added confusion. Alejandro: This is the first in what I hope is a series of records we’ll make together. The sound, to me, is four guys creating something new for themselves and creating a collective identity of their own; which is what good bands do. To do this we collectively use classic amps and instruments which is something we learned from records we both grew up listening to and dig on now. Groups like UFO, Rainbow, Deep Purple, Sabbath, BOC, April Wine (among many others) loom pretty large in our periphery at the moment, so it makes sense that aesthetics from those records rub off on our style and sound. That said, we like to keep an open mind and expect the music we make to kick the ball forward a bit creatively rather than simply rehashing the hits of yesteryear. John: We opened for Ace Frehley last fall. That was amazing. It was in a huge theater in downtown Boston and it wasn’t really all that long after we started playing. But I think that sort of gave us a little shot of confidence, knowing that we could play a show like that and not completely embarrass ourselves. Alejandro: We’ve had a few. Opening for Ace Frehley was a cool trip, but I think our first proper show in January 2014 in front of many hundreds of people, our friends and families included, remains with me the most. We wanted the band to be received as fully formed right out of the gate and I was nervous as hell. I think we went over well and all was fine, but it was intense. What are your upcoming live show/tour plans? John: We have a release show on September 9th here in town, and then we have to kind of cool out locally for a bit. But, we’re looking to do as much stuff as we can out of town, and hopefully hit Europe next spring/summer. John: I’m pretty obsessive about pre-British Steel Judas Priest. Not that I don’t love ’80s Priest, I just love the vibe of the earlier stuff. Rainbow, UFO, Deep Purple, Sabbath (especially the Dio years), Scorpions (especially Uli-era), Pink Floyd, the Stooges. I’m into a lot of the stuff that isn’t necessarily the Beatles, but is the result of bands trying to sound like the Beatles, like the Pretty Things, the Nuggets box set, Satanic Majesties, etc. Alejandro: So many to name. Collectively, there are probably few genres of music we don’t appreciate. Personally, as a guitarist I run in a few directions from Randy Rhoads, Michael Schenker, Ritchie Blackmore for guitar-heroics and wizardry to more contemporary and non-metal rhythm-players like Graham Coxon, Doug Martsch and Reine Fiske. I’m a sucker for a good song and catchy melody so really, in the end, everything starts with The Beatles. John: I’m one of those annoying New England craft beer guys, and I like the beach on a level that most people don’t really understand. I should probably just get it over with and start surfing at this point. Alejandro: Besides drugs and alcohol? I like a strong cup of coffee, a crossword puzzle, and travel. John: Oh man. Probably Ziggy Stardust. It’s really just a perfect album. I feel good about picking that one. Alejandro: This always changes. Today it’s Innervisions by Stevie Wonder. The production is so warm and enveloping and subjects are dark and heady. Next week it will be Saturation by Urge Overkill. What’s the heavy music scene like in Boston? John: It’s pretty great. We have so many styles represented and people take it seriously. We have a great little community going. For years and years, metal tours didn’t come through Boston proper all that much, but in the past 5 or so years, there has been a sea change in that regard, and I think that has given the local heavy music scene a real boost. Alejandro: It’s loud as hell. It’s destroying my hearing, but I’m glad the scene in this town has developed into what it is today. There are many bands making crushing music in Boston and making moves onward and upward. I’m glad to know many of them… bands like Summoner, KIND, Rozamov, White Dynomite, Gozu, Elder just off the top of my head. There are many more I’m forgetting to mention. Boston’s heavy rock scene is legit. John: We’re just really thankful to Tee Pee for putting out this record and getting our name out there so more people can hear our stuff. We’re proud of it and we can’t wait to get in front of as many people in as many cities as we can.